A while back I took a peek into the history of rope and I did my very best to side-step the whole messy, controversial topic of hemp. I was feeling pretty clever about that. But a few of my readers called me out (more than a few actually) so I guess I wasn’t so clever after all. So I guess we’re doing this. Let’s have some hemp history! You cannot delve into the history, cultivation, and use of hemp without getting all tangled up in the legalization of marijuana in the United States and the socio-economic politics of that. Plenty of the links I provide here in this post are going to take you to sites that advocate the legalization of marijuana. What is my personal opinion on that subject? a) I don’t care very much and I wish politicians would work on issues like the stunning illiteracy rates in our children and our national debt instead of who can smoke what. b) I wish people who got high would stop driving. c) Every single person I know who gets high (and I know a lot) tells me they do it for medical reasons and not to get giggly, relaxed, and silly. The fact that they do get giggly, relaxed, and silly is an unavoidable side effect. d) Nearly all of the people who are smoking pot for “medical reasons” think I should stop taking aspirin when I get a headache because they read somewhere that aspirin was dangerous. Hemp is a member of the cannabis family. All members of the cannabis family contain THC and useful fiber. Today the cannabis grown for industrial purpose, which is what we call hemp, contains about 35% fiber and trace amounts of THC. The cannabis that is grown for medical reasons and/or to get people high, which we call marijuana, contains about 15% fiber and LOTS of THC. The original, ancestral plant that modern members of the cannabis family originate from no longer seems to exist anywhere. It was bred and cross-bred and cultivated and changed into what we have today. But its safe to say that at one point humans were using the same cannabis plant to cultivate fiber and get high. According to Prehistoric Textiles: The Development of Cloth in the Neolithic and Bronze Ages with Special Reference to the Aegean, cannabis probably originated in northern Asia in the Neolithic Age. It spread all over the Eurasian continent and into Africa very rapidly sometime around 1000BC. The plant itself adapts easily to new environments and can grow almost anywhere. Its just a weed after all. 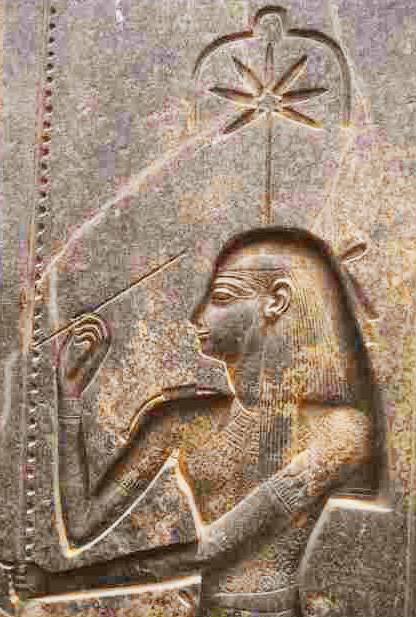 The Egyptian Goddess Seshat with a cannabis leaf above her head. Image found on The Holy Herb. And then he explains how those Scythians were getting righteously stoned from the same plant. The Scythians, as I said, take some of this hemp-seed, and, creeping under the felt coverings, throw it upon the red-hot stones; immediately it smokes, and gives out such a vapour as no Grecian vapour-bath can exceed; the Scyths, delighted, shout for joy. Scythian hemp bowls from Twelve Constellations of the Girdle of Gaia. Things get a bit muddled here. That’s probably because most of the early, 20th century archaeologists who studied artifacts couldn’t tell flax from nettle from hemp and referred to any woven fabric as “linen”. Jadwiga Zajaczkowa speculates that since there are mentions of medieval pot-smoking Romans, Grecians, and Arabs but nothing for Northern Europe that the varieties of cannabis had begun to distinguish themselves. Vikings had hemp rope and hemp sailcloth but they don’t seem to have smoked it. So I’ll go out on a limb as say that by 500 AD, we had two distinct varieties of cannabis, the kind cultivated for fiber and the kind cultivated for medicinal/recreational uses. Hemp production was going strong in England by 800 AD. It shows up in Scotland by 1000 AD. Russia was growing flax in the north and hemp in the south. As England developed into a naval power, and needed more and more hemp to make rope and sailcloth, hemp had to be imported from Russia. Henry the VIII began passing laws requiring farmers to grow hemp as a way to maintain his nation’s independence. By the 16th century, those requirements had spread to all British colonies. Yes, in colonial days, American farmers were required to grow hemp, in certain amounts, to keep the British Empire afloat. It was the law. The British Navy needed miles and miles and miles of hemp rope for each ship. British naval captains sailed with hemp seed and were under orders to distribute that seed and foster the cultivation of hemp whenever they could. Thus hemp reached the New World. During and after the Revolutionary War, American farmers were still growing hemp. There was a whole country to explore and develop. The new nation needed its own navy. It needed rope and sacks and paper. You couldn’t run a government without paper and most paper was made from old, worn out hemp cloth. The first drafts of the Declaration of Independence were on hemp paper. George Washington grew hemp. Thomas Jefferson grew hemp. It was their patriot duty and they did it to set an example for the nation. Many farmers followed that example and hemp was an important crop in America. Hemp can grow almost anywhere but it found a real home in Kentucky. American hemp cultivation may have begun in places like Virginia and Connecticut, but it boomed in Kentucky and later Missouri. In 1850 Kentucky produced 40,000 tons of hemp. Hemp is harvested and processed much like flax and nettle. All those bast fibers are handled in much the same way. Cultivated hemp is planted close together, forcing it to grow straight and tall. Then its cut and the stalks are retted. Retting can be as simple as laying them out for several weeks to collect morning dew. It can mean tying them into bundles are submerging them in water. Retting is about giving the stalks time to soften and decay. After retting, the hemp goes through a hemp brake to brake it open. The woody pith has to be separated from the outer fibers. Thomas Jefferson invented a new, better hemp brake and refused to patent it. (That’s significant since he is the father of our patent system.) He thought that the efficient processing of hemp was too critical to the success of the nation and choose to give away his innovation instead of profiting from it. Breaking hemp with a hand brake in Central Kentucky c1920. Photo Credit: Kentucky Historical Society. 1) The Philippines started making better rope. Its called Manila hemp but its not a cannabis plant at all. Its a relative of the edible banana. 2) The invention of steam powered boats meant the world didn’t need so much hemp rope anymore. 3) The US government started taxing hemp (and all cannabis) growers. Taxes always stifle economy. 4) Marijuana and hemp got caught up in Prohibition. 5) We learned how to make rope from metal and synthetic materials. 6) In the 1940’s American farmers got talked into growing hemp and many of them lost money in that venture. During World War II, the Japanese forces captured the Philippines (and did terrible things to those people that the world has mostly forgotten about) and the US lost its access to Manila hemp. So the Hemp for Victory campaign was launched by the US Department of Agriculture. 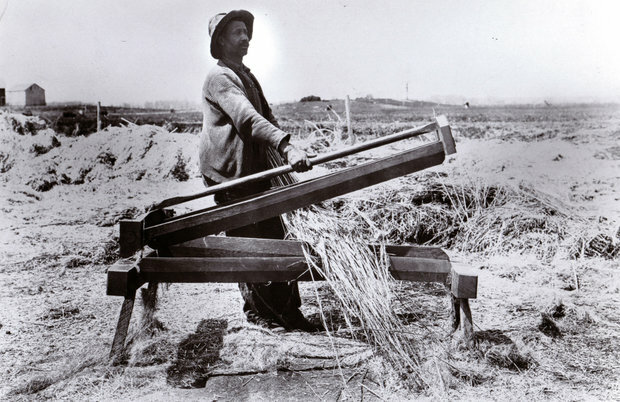 Plants for processing hemp were built and farmers started planting. Then we won the war, liberated the Philippines, and went back to Manila hemp. The demand for American hemp crashed. That was the last, most recent big push to revive the hemp industry. Hemp has been on the ropes (hahahahahaha) for several decades but it hasn’t been knocked out yet. Farmers have been growing hemp under special permits ever since they needed special permits to grow it. Sometimes those hemp farmers get busted because they are growing marijuana inside the hemp fields. Sometimes they get busted for no (apparent) reason at all. Hemp really is a good source for fiber. It really is renewable. Its easy to grow and doesn’t degrade the soil. Its definitely a better, if more expensive, source for paper pulp than trees. 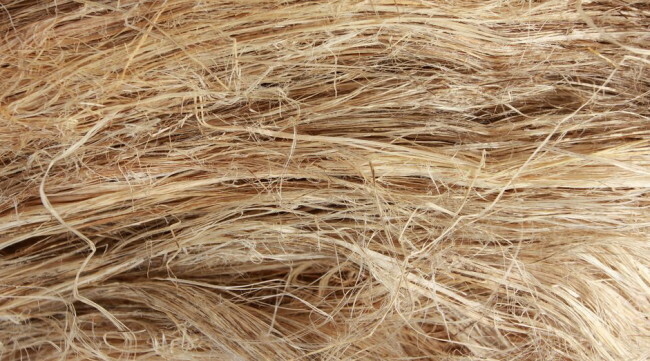 Now that we can remove the lignin from the fibers, it can be made into a soft, supple fiber. Hemp, industrial, fiber heavy hemp, won’t get you high. And its looking more an more like the laws against marijuana won’t last long anyway. I don’t think marijuana laws have much affect on hemp cultivation though. Unless the world goes back to sailing the high seas and fighting wars with wooden sail boats, the demand for hemp is low and will stay low. But there should always be some around for us intrepid crafters to play with. 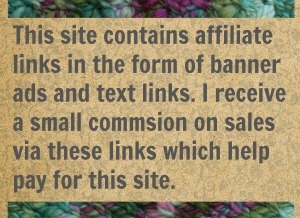 16 Comments on "Hemp – the Red-Headed Stepchild Of the Fiber World"
Thank you! I do love learning stuff like this… Partly for the history, and partly for Zombie Apocolypse preparation. I think it’s still possible for hemp to make a comeback – It’s often used in vegan clothing. Plus, hemp oil is becoming popular for health and beauty products, and cooking, too. (I’ve heard it has amazing anti-inflammatory benefits.) But, can the plant still be used for fiber after extracting the oil? I don’t know… Couldn’t find any info on it. What a timely post. Thank you. Some time ago I picked up a ball of polished hemp cord to “play with.” It’s been sitting here trying to decide what it want to be. Maybe coasters, placements, basket. I didn’t understand why it was so expensive. $5 for 70 yds. I believe your post explains the problem. Maybe I should check out unpolished hemp in hardware section. Thanks again for wonderful and useful info. $5 is a bit pricey. One more comment on hemp. The label on my ball of hemp said CAUTION: Do not ingest! Really? Do they think someone is going to smoke the rope? HaHaHa. Don’t smoke it! lol Or eat it. Or cram it up your nose. Warning labels are dictated by the lowest intelligence factor in a society I think. I love the history.The Scythians were amazing people. I believe they were famous for their felt also. I like when Herodotus called them “the Scyths”. yep. I wondered if that’s were George Lucus stole the name for the Evil Bad Guy Cult Of Star Wars Land. The Sctythians were very interesting. I agree. I had to restrain myself from going on a bit about them. The women warriors, the battle queens, and the whole “no woman can marry until she had slayed an enemy in battle” is just awesome. 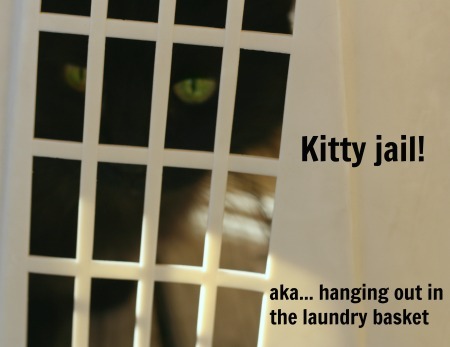 But It seemed a bit off topic for a yarn blog.